Cohesion is the way you connect paragraphs and sentences together in your essay. Together with coherence, cohesion makes up 25% of the mark in both Writing Task 1 and Task 2. In my experience, IELTS candidates often get their lowest score in coherence and cohesion. The good news is that it’s easy to make coherence and cohesion better. This article will look at some examples of cohesive devices, how you should use them and what IELTS examiners want when assessing cohesion in an IELTS essay. But first, let’s look at what good cohesion actually means. In IELTS, cohesion means using cohesive devices. Cohesive devices are sometimes called linking words, discourse markers, connectives or signposting language. Some examples of cohesive devices are “for example”, “on the one hand”, “secondly”, “in conclusion”. Cohesive devices make it easier for the reader to understand your essay, because ideas are introduced and linked to other ideas. So what are IELTS examiners looking for when grading cohesion? IELTS cohesion: what do the examiners want? Examiners want cohesive devices to be used appropriately, effectively and correctly. 1. 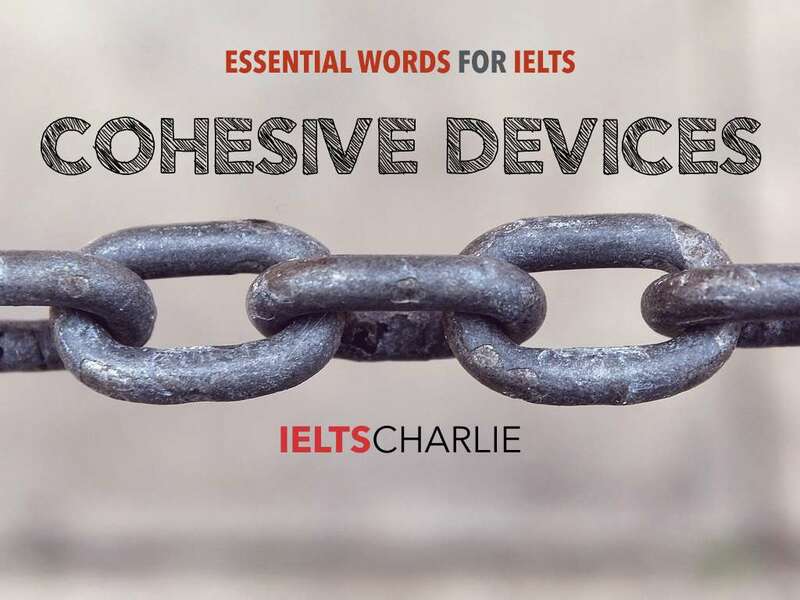 IELTS examiners want cohesive devices to be used correctly. One of the biggest mistakes made by IELTS candidates is using cohesive devices they don’t really know. They include words like “furthermore” and “consequently”, thinking that the IELTS examiner will like it. But if they use these words incorrectly, the examiner will mark them down. The candidate makes inaccurate use of cohesive devices. In other words, if you use cohesive devices incorrectly, you may get no more than a band 5. Key Tip: Only use the cohesive devices you know well. Appropriate and effective use of cohesive devices also means using them in the right quantity: not too many and not too few. Many IELTS candidates make the mistake of using too many cohesive devices. They throw in lots of cohesive devices, thinking the IELTS examiner will like it. In fact, they will mark you down. Candidates use a range of cohesive devices appropriately although there may be some under or over-use. In other words, if you use too many or too few cohesive devices, the maximum score you can get is a band 7. Key Tip: Use just the right amount of cohesive devices – not too many and not too few – just as you would do when writing an essay in your own language. One or two cohesive devices in each paragraph is usually enough. uses a range of cohesive devices appropriately although there may be some under or over-use. To summarize, if you want a Band 8 or above for cohesion, only use cohesive devices when necessary. Use them appropriately, use them correctly and use them effectively. In this slideshow, you can find some of the most useful cohesive devices, organized by their function (e.g. adding ideas and giving examples). Don’t try to learn them all! Just learn the ones that you almost understand (but not quite). 1. Don’t memorise the words. Try to understand how these words are used. You can use Reverso Context to see how these words and phrases are actually used in English. This website will also translate the English phrase into its equivalent in several other languages, including Arabic, Russian, German, Polish and Spanish. 3. Get your writing checked by an experienced IELTS tutor. I offer a writing correction service and I will correct your mistakes using cohesive devices (and many other things!) and I will give you lots of suggestions for how to improve. One way to improve your IELTS cohesion is through referencing. This is when you refer back to something you wrote earlier in the essay or earlier in the sentence, or refer forward something you are going to write later in the essay. You use reference words to show these connections. Almost all scientists agree that global warming is caused by increased C02 emissions, but they do not always agree on the solutions to this problem. If you found this article useful, please share it by clicking on one of the share buttons on the side of the page. Thanks!